National Memorial Arboretum at Alewas, near Lichfield, Staffordshire. 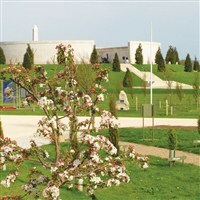 Located in the heart of the country, the National Memorial Arboretum comprises 150 acres of trees and memorials devoted to the concept of Remembrance. Particularly stunning is the Armed Forces Memorial which takes its inspiration from landscapes of prehistoric Britain and ancient Rome. There is a land train available for the less mobile (payable individually), a gift shop and restaurant.